In AQ's travel map there is a small island to the southeast of Lolosia labeled ???. ZAX has it marked as Bronwyn Island after the quest with the Lilliputians (talk to Aquella in Yulgar's Inn). However the island is actually Mulligan's Island as referenced in Sailor Boon's quest, "X Marks the Spot." It specifically talks about the island directly southeast of Lolosia which you reach by crossing the Harkor Strait (which should be added to the map). Bronwyn is described in the relevant quest as being "uncharted," so there's no place on the map to put it. Glad to help you guys anytime. That's odd. I thought AQW was supposed to be using the same map as DF. Those are mirrored, but they at least provide a non-clouded look at the AQ region. Here's Iaon's picture, cropped and rotated appropriately. We can see the edge of Neld on the right side of the picture (Northwest on the original). I assume the oceans on Cheddar's map are out of scale, but if they aren't then the cove of the Great Sea near Lolosia needs to be much bigger--Inilar is much closer to the Middle Isles in the map than it is on the picture of the planet. Well now that I look at that view, I can see that it has been curved more to the surface of the world. It's displaying Lore as smaller than the AQ map and Battleonia is still the same size, making it have to curve more to fit the lesser dimensions. The proportions of the land masses do seem out of scale in the latest pictures, compared to the planet views from WarpForce. 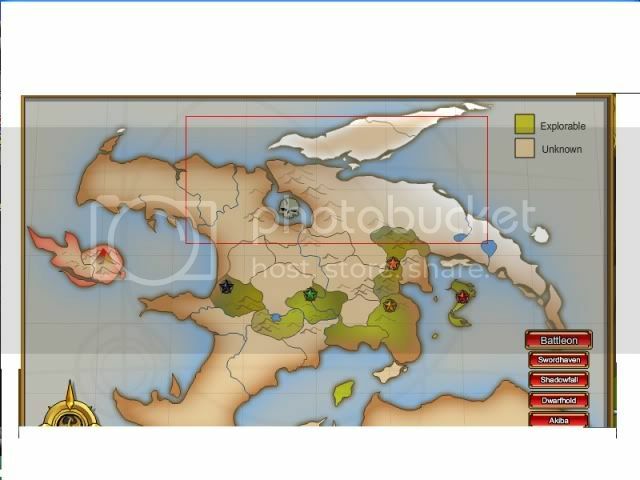 If you compare Iaon's pic with Orodalf's pic, you can see there's not much room on DF's LORE for the western half of the Battleonia continent, which includes a much larger desert, PLUS Deren and Vandar, and whatever other land masses might be present on the planet (the WF LORE has a few unidentified islands). This first hard to see picture appears to be of the Middle Isles and other parts of LORE. It doesn't appear to be a planetary picture so I'm guessing this is a flat map rather than a distorted one. This suggests that the Middle Isles are indeed much more curved than our current iteration of the Travel Map by ZAX shows. Anyway, this one's probably not as useful since it's kinda messed up, but you can see the shape and central lake of Neld at the top of the planet in fairly close proximity to the Middle Isles, and the islands of Paxia are clearly defined and placed in a more southern position than on the travel map. I thought that was an illusion from loco the demi god?? ( I think he is a demi god or a god of some sort). as for that other screenshot that is new to me. Something has been bothering me about these planet shots and I finally figured out what it was. The AE staff is REUSING island art! I've made a composite test to show you what I mean. On the left is a planet shot from DF's choose-your-own-adventure quest. Nothing too strange, we've seen that island next to Inilar in many other shots. In the center is a shot from WF showing what appears to be an unidentified continent, partially covered by clouds, moderately large and clearly an ocean away from Inilar. On the right, I've taken that chunk of unidentified continent and composited it over the island next to Inilar. With a very minimal amount of stretching I've managed to layer it perfectly on top. There is a bit of color distortion due to the brightness contrast between the two shots, as well as the shadow from the cloud, but otherwise the shape is quite distinct. I am also suspicious of the large island chain in the lower right hand corner of the center image. It looks quite similar to the small island chain next to Inilar. I am almost certain that with a similar amount of distortion I can make them match. All in all I am rather disappointed in this revelation. What does it mean for our quest to create an accurate map? Hm, this is unfortunate. It confirms what I have thought about minimally in the past--that the animators aren't actually putting as much thought into this as we would like. We know from the general tone of AQ and its various Sagas (in- and out-of-game) that Falerin is very continuity-conscious. However, it is also easily seen that the other games (excluding WF) are much less so--I feel that there was quite a bit of maneuvering and deus-ex-machina-ing in order to justify the split in timelines. As we all know, it is now accepted fact that DF is in a different timeline from AQ. However, I hesitate to believe that Artix created the game with that in mind--he probably thought "Five years will never come," or "We probably won't be here in five years." It is indeed disappointing, but all it means is that we can't use these new DF maps as guides. In my view, AQ and WF are still fair game. Actually it's not the DF map I'm disappointed in, since the DF screenshot doesn't have the unidentified continent in it. It's the WF shot in the center of the screen that has the duplicate artwork! In fact you can even see the smaller version of it in the upper right corner of the center image next to Inilar. What I'm saying is that there are two of the same island on ONE planet in WarpForce. The reason I used the DF map is because I was able to get a clearer screenshot of the island next to Inilar so you could see the shape of it when I did the composite. My best guess is that it means nothing and should be taken as canonical unless something comes up to contradict it. Other than the DF and AQW maps that is. Those... well I don't even want to think about those maps. The clouds got in the way a lot of the time, so there's not a very clear view of the Middle Isles or the nearby Battleonia area. But I figure we already know pretty much what that part of LORE looks like. So here's my problem... where the heck is Deren? Or Vandar for that matter? What we CAN see are those duplicate islands, and a strange land mass at the south pole that seems to be mostly desert or ice except for the coastal areas. Even the northern coast of Battleonia looks unfinished, like a section is missing. Note how there is no dark grey-blue area around the coast to indicate the ocean dropoff. And Neld is squashed as well. All I can say is unless they update the art in future quests, we're at a dead end with these space shots. They don't seem to attempt much accuracy at all. I found new pictures of Lore from space. Got the pictures from the new release from MQ, Turkaggedon. I cropped the picture, and only put lore here. I don't know if these are reliable though. Lore looks very different, and IMO I don't think that the MQ team put much effort in drawing the map. I don't really want to put this out there, but if it's from MQ...the Reset maybe? the new DF map looks like the northernmost part of the AQW MAP. @the clan master The problem with that is that the DF one is missing the skull island. Though that might have been implemented for the sake of Drakath's Chaos Spire, and therefore doesn't exist outside AQW. Now this is indeed intriguing! The new DF map does seem to align with the AQW map pretty closely. And I spoke with Maxwell about the AQ map, since he had been working on it during the Truth Saga, and he gave me some good info. For one thing, Battleonia really SHOULD be shaped like a dragon's head, similar to the AQW map. The question now is, since we've seen the WF world and Battleonia doesn't seem dragon-shaped (see above post), should we try to work on our own map that IS dragon shaped and set aside the WF map? Now that I compare the three maps together (AQ, DF, AQW), it seems there are more similarities than we first thought. Greenguard is in a pretty close proximity in both AQ and AQW. The Neverglades (marsh) is in the same area as the Bennuju wetlands in both AQ and AQW. Skraeling Desert and the Sandsea are in similar positions in both AQ and DF. The Graveyard in AQW is near the Canyon of Lost Souls in AQ. Keeping in mind that with several different animators on several different games creating various maps for different purposes, I think it can safely be assumed they're intended to be the same, but the logistics of making them all match up perfectly are troublesome. I would be inclined to start with the AQ map, the new DF map, and the AQW map, and go from there. As has been noted, they do seem to fit at least somewhat. But otherwise, I shall leave this to y'all. I have little AQ experience, which is a bit mandatory for this particular endeavor. Correct if I'm wrong, but in the Titans of Battleon quest in DF we travel into the future to the city of Battleon which is so identical with AQ that we can assume that it's the same. In the end of the quest someone (Cysero I think) says that the timeline now might split and that we'll maybe never end up like that in DF. 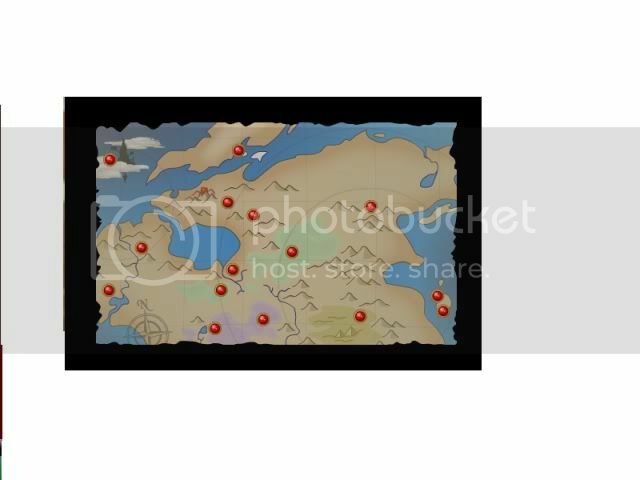 But the world map of DF before this quest (if there were one) should be the same as the world map of AQ. Since before that quest the timelines were the same and so would the maps, if nothing drastically happens like worldwide earthquakes. First, the maps are proven different already. Second, there is substantial evidence at this time that the timeline split occurred even before that quest as there are differences in people's histories that are older than it. I figured i would post this map. I was actually the first person to ever see it, back in the old #755 chat room. Genoclysm has thoroughly debunked its accuracy, and Falerin, despite being the one who posted the map, says it is not accurate. Never the less, it was one of the earliest official maps made and i think it should be preserved. Really take it with a grain of salt though, as I said its way off.